Andrea's Random Lil' Blog: A Southpark character? No, just my new haircut! Thanks to my lovely grand-nephew Afonso, I got to know this cool little website: Minijuegos. There you can build your very own Southpark character, or make yourself into one! 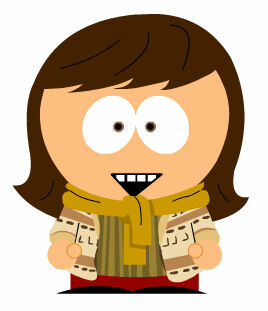 So, this is what I might look like if I lived in Southpark! It's quite cold here at the moment, that's why I am wearing a scarf. Also the hair is what looked more like my new haircut. I love the links Afonso sends to me, they are always so cute! I done one of these also, now we have a matching set! My Southpark Character.